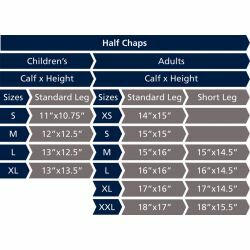 A smart, easy care alternative to suede, these fabric lined half chaps feature covered elastic inserts in the leg and over the foot for the perfect fit. A smart, easy care alternative to suede, these fabric lined half chaps feature covered elastic inserts in the leg and over the foot for the perfect fit. Reinforced inner legs for durability, strong zips with press stud fastenings and stretch stirrups for security.